In the United States, it is estimated that 16 million people have PFAS contaminated drinking water. Two older men and a young boy each hold spinner rods over the murky brown water. A small white cooler sits between them. “Have you caught anything?” I ask smiling, hoping that they won’t feel threatened by the question. We are in a public park, a few feet from the main trail, tucked behind cottonwood trees. The fisherwoman in me can’t resist asking the next question, “what kind of fish were they?” The men shake their heads and shrug their shoulders. Clearly, they could care less. I, on the other hand, am infinitely curious about what type of fish could actually survive in the silty sediment-laden waters of Fountain Creek. A recent electro-shocking project by the Colorado Parks and Wildlife Division revealed six different species of fish live a few miles upstream from where I stand. This particular stretch where the men are fishing is one of our water sampling sites. The Sierra Club Grassroots team, The Fountain Creek Water Sentinels (FCWS), has pulled water samples from here since January 2018. Less than a year ago we joined the 25 -year legacy on the Colorado River Watch program and signed on to test pH, alkalinity, hardness, dissolved oxygen ad 13 metals at three sites along Fountain Creek. When the FCWS agreed to conduct water sampling, we were just beginning to understand the absolute tragedy that has occurred in the communities along Fountain Creek. The aquifers and wells that supply 70,000 residents with drinking water are contaminated with Perfluoroalkyl Substances or PFAS. PFAS are man-made chemicals used in firefighting foam, fabrics, food packaging, and other products. In the United States, it is estimated that 16 million people have PFAS-contaminated drinking water. In Southern Colorado, 70,000 residents have been victim to the decades-long poor stewardship practices at Peterson US Air FOrce Base. Military bases around the country use AFF (Aqueous Film Forming Foam) during firefighting training exercises. 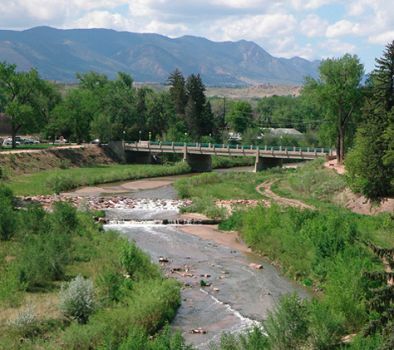 In 2016, a series of EPA directed events prompted the discovery of two PFAS chemical called PFOS and PFOA in the drinking water supply in Fountain, Security, and Widefield. PFOS and PFOA are persistent, pervasive, and bioaccumulative. The source was traced to Peterson Air Force Base. 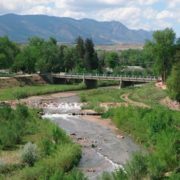 All four local water districts stopped using groundwater from the Widefield aquifer for drinking water.ANd while the water districts have made heroic efforts to provide residents with non-contaminated water, they are hindered by lack of EPA maximum contaminate levels (mcl’s) for PFAS. The EPA has yet to set mcl’s for PFAS in drinking water leaving the regulatory and financial burden to the states and local water districts. Stroll the neighborhoods in Southern Colorado and you will find the typical mix of unkempt homes needing paint jobs co-existing with tidy well-kept houses. The affected communities are working-class families. You will see a high number of urban gardens and backyard chickens. You will find hard-working individuals who are afraid to drink, their water. You will hear stories of loved ones, and neighbors and friends and brothers and sisters and aunts and uncles and parents who have died of illnesses and cancers that have been linked to PFAS exposure. Since 2016 there have been no community-wide health studies, There are no longitudinal health studies or health monitoring for the communities. The impact of decades of PFAS exposure in their drinking water has left thousands of people with questions and uncertainty. I consider the scene before me, that of the two men and the young boy angling for fish large enough to keep. There’s only one reason to keep fish and that’s for eating. I find myself torn with a dilemma that many environmentalists can relate to: there are no signs along the creek warning people not to eat the fish. There is no evidence to say that these fish are contaminated with PFOS and PFOA chemicals. But the research tells us that PFAS chemicals are persistent, pervasive, and bio-accumulative. Surely these fish cannot be “safe” to eat? No one knows if the PFAS contamination plume has stopped, dissipated, or if it made it all the way to Pueblo. There are currently no health studies, no health monitoring, no testing of Fountain Creek for PFAS. We do know that the Widefield Aquifer is permanently contaminated and that the waters of Fountain Creek flow in and out of that aquifer. Please don’t eat the fish. I turn away from the happy fishing family, but not before I say “por favor, no te comas el pescado.” Please don’t eat the fish.